Not a bad start. The controls and movement are solid. The character feels too heavy for me, though. The graphics are obviously crude, but you do a good job of making clear what is happening. Even one unique frame for the attack would improve this a LOT. The movement of the attack itself feels pretty good. Not sure why the dead witches turns transparent instead of going away though. 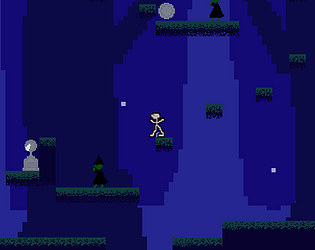 Also, jumping up a series of tiny platforms is very tedious. That sort of challenge died with the NES for good reason. I think you can do better with how you challenge the player!